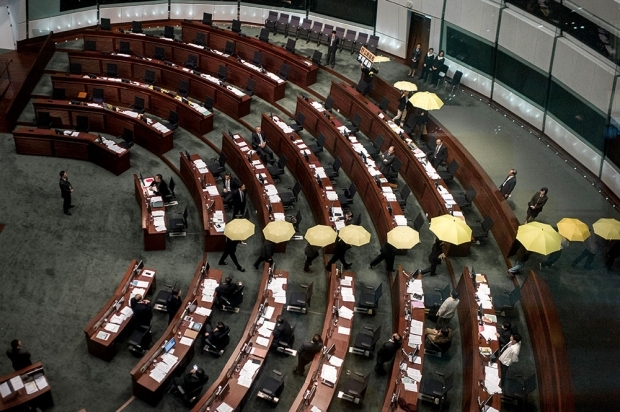 Lawmakers carrying yellow umbrellas—the symbol of the pro-democracy movement—walk out of the legislative chamber as the “Consultation Document on the Method for Selecting the Chief Executive by Universal Suffrage” is about to be presented in Hong Kong on January 7, 2015. Tensions remain high following more than two months of mass protests. Sino-Hong Kong relations urgently need one thing to salve the ills of today and ensure a better tomorrow, and that is for true leadership to emerge. And that means leadership in government, it means leadership in opposition, and it means leadership in China’s handling and understanding of Hong Kong. What we have seen in this winter of discontent and protest is a complete and tragic failure of leadership on all sides. China failed. The months of protest were a direct result of ham-fisted and tone-deaf writing and speaking about the city, showing no empathy for or understanding of what makes it work and what threatens that working. The Hong Kong government failed. There hasn’t been one statement or report on the evolving political consciousness that showed an attempt to represent truly the breadth, depth, and even diversity of opinion and feeling. Leung Chun-ying failed. Admittedly Hong Kong has never had a true leader as governor or chief executive, moving from boring bureaucrats to tired tycoons with only Chris Patton as an interlude showing—to little lasting effect—a politician’s love of media, attention, and confrontation. But Leung has seemed to have a spectacular lack of ideas, integrity, or interconnection with the people he is supposed to “execute” for. The protestors failed. While they brought the city spectacularly and movingly to the streets, everyone involved ultimately actively eschewed taking a true leadership role, they never moved the rhetoric or thinking to a place where dialogue or negotiation could meaningfully take place, and finally they exhausted or irritated many of the very people who supported them in the first place. What these months have showed, though, is that Hong Kong is a place with a political consciousness. It is a place where the people have a wide variety of views, desires, demands, and issues. And it has defined Hong Kong as a place that is very clearly not willing, able, or ready to move closer to China without its own identity being recognized, respected, and reacted to. It needs a few people willing to take the lead in saying, “This is who we are; this is what makes Hong Kong special; and these are the things that, within the context of big and powerful China next door having suzerainty, we must preserve protect and defend.” There’s no one answer to that list of things. They are what need to be brought out into the open, discussed, debated, and ultimately decided. The argument about how the Chief Executive of Hong Kong should be nominated and elected is to me but a sideshow to the real issues of what is Hong Kong, how is its relationship to China defined, how is its special character preserved and developed, and how are its people and their beliefs given expression and representation. Hong Kong’s relations with Beijing in the days, months, and years ahead are bounded by the relative sizes, powers, and legal statuses of the two actors. Those relations can be shaped positively by the people themselves, however, if they have the leaders with vision, courage, and integrity to make that happen. The C.Y. Leung administration has just released its “Report on the Recent Community and Political Situation in Hong Kong”. The report simply compiles the views of various political groups and leaders in the community. The pro-democracy movement had hoped that this report would be sent to the Standing Committee of the National People’s Congress (NPCSC) so as to facilitate the emergence of an opportunity for it to revise its decision on political reforms in Hong Kong announced at the end of last August. Sending the report to the Hong Kong and Macau Office would not have this effect. On the next day, the administration launched its second round of political consultations on political reforms within the framework set by the NPCSC decision. The pro-democracy legislators clearly indicate that they will not take part in the consultations and will veto the administration’s political reform bill when it arrives at the legislature. Their decision is legitimate and representative of Hong Kong people. They together secured 55% of the votes in the last direct elections to the Legislative Council on a pro-democracy platform, and they will face the verdict of the electorate in 2016. What representativeness can the C.Y. Leung administration claim for its political reform proposals? The Alliance for True Democracy asked the Public Opinion Programme at The University of Hong Kong to conduct a survey at the end of last month. Forty-five percent of the respondents agreed to the statement that the NPCSC decision offered a false election to Hong Kong people; 23% disagreed; and 23% could not decide. Among respondents in the age group of 18-29 years old, 71% agreed to the statement. Despite the promise of C.Y. Leung administration to consult the public, it is obvious that the pro-establishment elites would secure an absolute majority of seats in the small-circle elections to the Nomination Committee; and this absolute majority would then control the entire list of candidates for 2017 Chief Executive election. Under such a system, there will be no meaningful choices for Hong Kong people, and there will be no genuine competition. In short, there is no real election. Hong Kong people naturally reject a political mobilization exercise. In the earlier debates on political reform, the C.Y. Leung administration claimed that universal suffrage would be a major step forward; and critics indicated that universal suffrage has been practiced in North Korea for many decades already. The Chinese authorities most unreasonably establish a linkage between the 2017 Chief Executive electoral system and that for the 2020 Legislative Council elections. If the government’s political reform bill is to be vetoed, it would refuse to reform the latter. Hong Kong people understand that our fight for true democracy is a long-term political struggle, and there will be no breakthrough in the near future. But as long as we don’t give up, we have not lost. At least we can uphold our dignity and principles. We don’t want to see Hong Kong reduced to just another big city in Mainland China. At base is the question of what political representation really means. If the premise of the Hong Kong government is the Basic Law as interpreted by Beijing, then Hong Kong democracy—with Chinese characteristics—is not representation by and for the Hong Kong people. Reading over the “Constitutional Provisions” which form the first page of the report, it is clear that constitutional development is not to be defined here in Hong Kong. Reforms to the nominating process are to be reported by the Chief Executive, decided by the NPCSC, consented to by the Chief Executive, and approved by the NPCSC. The reason for the Umbrella Movement was precisely because Hong Kong people did not find the “broadly representative nominating committee” to represent their interests, and thus the idea of universal suffrage is false. In thinking through this I found myself reaching for the late Fang Lizhi’s 1986 argument that democracy is not something bestowed by people in charge. Reflecting on his experience reading a flyer from his local congressman in New Jersey, he explained his astonishment that this person “was ‘reporting’ to us….He wanted us to know how he stood on the issues, and whether we agreed with him…this man was clearly accounting to me for his actions. In democratic countries, democracy begins with the individual. I am the master, and the government is responsible to me.” The Hong Kong government’s report, with its “Constitutional Provisions,” shows that its starting point has not changed since the Umbrella Movement began. I do not know whether, as the Hong Kong Federation of Students’ Lester Shum has predicted, this disappointment will lead to further protests. But it is clear that there is a divergence in the representation of recent events and between two definitions of representation as part of universal suffrage. When we think about Hong Kong and the idea of constitutional development, it may be useful to recall what constitutionalism has meant in the Chinese past. In the Western context, constitutionalism is about limiting the powers of government. But when these ideas were translated onto the Chinese scene in the nineteenth century, as Philip Kuhn reminds us, “principled criticism” was meant to make the state stronger, reformers like Liang Qichao thought of participation as all citizens submitting to duty to the community, and unity with national self-preservation was first and foremost on China’s constitutional agenda. Writing in 1994 and looking to the future, Kuhn concluded that, “the Chinese constitutional agenda will still be addressed on China’s terms, not on ours.” The notion that “the Central Authorities, the HKSAR Government, and the people of Hong Kong” share the same “common aspiration” suggests that this history casts a long shadow. The report is little more than a laundry list of what happened during the occupation movement in Hong Kong, with significant empirical and logical gaps. It describes how the occupation movement started and ended, without accounting for why such an unprecedented and large-scale civil disobedience could erupt in the first place. It fails to mention the strong backlash against the National People’s Congress Standing Committee’s (NPCSC) decision that the future Chief Executive candidate will need to be endorsed by at least half of the nomination committee, which is going to be controlled by Beijing just as the current election committee is. Scholars and democratic activists, including the most moderate ones, were outraged. After describing the large scale occupation movement that lasted more than two months and was joined by hundreds of thousands of protesters, the report jumps to the conclusion that it is a “common aspiration” of the Hong Kong people to actualize universal suffrage under the NPCSC framework. It doesn’t explain why so many citizens would come out to protest the NPCSC decision if the “common aspiration” of the Hong Kong people is to accept this decision. As such, the report is amount to telling the Hong Kong people that “we see you protest, but we are ignoring your voice whatsoever.” It is noteworthy that once the report was published, the Hong Kong police started the mass arrest of organizers and participants of the occupation movement. Hong Kong newspaper Mingpao, citing an anonymous governmental source, claims that no less than 1,500 students, legislators, scholars, and other activists were targeted for arrest. The establishment is apparently in a triumphalist mood in the aftermath of the occupation. Ever since the government managed to clear all the occupied zones, the occupiers have had low morale. With the unfolding of the persecution, many active participants will be occupied with legal entanglement for a while. But it does not mean that the government’s plan to push for a conservative political reform under the NPCSC framework can set sail in calm water. Popular support for the HKSAR government continues to slide, and the distinct Hong Kong identity continues to grow at the expense of the Chinese identity after the occupation. Many young Hong Kongers, who awakened in the air of liberation in the occupied zones and in their first-hand experience with pepper spray, tear gas, and police club beating, will not go to sleep again. After a period of hiatus, large-scale civil disobedience could reemerge at any time, with a vengeance. This back-and-forth rhythm of mass movement is common in democratic movements all over the world. We could just look at the wave of democratic movement in Taiwan in the wake of the mass arrest and persecution following the Formosa Incident of 1979 to get a sense of what may await Hong Kong in the years to come. “Why did you twist the truth?” Wong asked, referring to the report Lam had just submitted to Beijing on sentiments in Hong Kong in the wake of the controversial decision August 31. Such words sit oddly in a report on public sentiment. They are a political formula to create the impression that all three parties—Beijing, Hong Kong, and the Hong Kong people—are of one mind, when clearly such is not the case. According to the report, there exists a common support among Hong Kong’s populace for Beijing’s decision to deny them the right to vote for the candidate of their choice. That being the case, why was Occupy Central in the planning for two years? Why did university and secondary school students go on strike? And why did university vice chancellors lend their moral authority to this student endeavor? If the government in Beijing, the government in Hong Kong, and the Hong Kong people were all of one mind about universal suffrage, why were thousands of people protesting? Why are dozens of people now being rounded up by the police? It turns out that the Hong Kong authorities know full well that the community is not behind them. In fact, the day after the release of the community sentiment report, the Hong Kong authorities released a second document—the timeline for the second round public consultation on universal suffrage in 2017. In that report, an abbreviated quotation appears. “It is the common aspiration of the Central Authorities, the HKSAR Government and the general public in Hong Kong to implement universal suffrage for the CE election in 2017.” But this time, there were no extravagant claims of support from the community. Instead, it says, “Whether or not universal suffrage for the CE election could be implemented as intended in 2017, however, would depend on whether the community agrees to complete the ‘Five-Step Progress” within the framework of the Basic Law and the Decision of the NPCSC. Nowhere do we learn that there is already a common aspiration that joins the two governments and the people of Hong Kong. Hong Kong’s credibility lies in shreds after the government told another untruth while ostensibly trying to set things straight. But with Hong Kong now totally under Beijing’s thumb, it is difficult to see who is teaching whom what to say. For students of history, these comments bring to mind to Deng Xiaoping’s first speech after the 1989 crackdown in Beijing. In his first public appearance, he said to martial law units, “I once told foreigners that our worst omission of the past ten years was in education. What I meant was political education, and this does not apply to schools and students alone, but to the masses as a whole.” Those words ushered in a massive patriotic education campaign that has shaped a whole generation of young nationalists. Nationalism and the contested idea of patriotism bubbled below the surface throughout Occupy Central, with repeated allegations of unspecified hostile foreign forces driving the protests. There are signs that Hong Kong’s schools could become the next ideological battleground, with Basic Law committee member Rao Geping suggesting national education should be reintroduced with an emphasis on Chinese culture rather than ideology. Given that the Umbrella movement was born out of a precursor struggle over national education in 2012, such a move could only give protestors a new focus. Although Occupy Central has been cleared and its main leaders face arrest, its spirit remains in the banners that continue to appear on totemic HK landmarks like Lion Rock and in the small-scale street protests that flare up nightly. What should not be forgotten is that an estimated 1.2 million Hong Kongers took part in Occupy. At a time when a record low number of Hong Kongers identify themselves as Chinese or citizens of the People’s Republic of China, the mere idea of re-introducing national education can only serve to deepen Hong Kong people’s alienation from Beijing. The Umbrella protests made it clear that Beijing has lost the confidence of many Hong Kong people. The Hong Kong government’s political report makes it clear that the time for healing has yet to begin. The division between Hong Kong and the mainland is wider than it has been at any time since the 1997 handover. Yet, paradoxically, this wider space could allow Hong Kong more breathing room. There has long been fear that Hong Kong would become less important as China become more developed and more open. China, however, is going through its own period of retrenchment as Xi Jinping pursues his ambitious agenda. That makes an open Hong Kong—the freest city in the People’s Republic of China—more relevant than ever. Hong Kong is China’s international window on the world. Chinese companies turn to Hong Kong’s stock and bond markets to raise international capital. It is Hong Kong law in Hong Kong courts where disputes are resolved, sometimes between two mainland companies. Civil society, NGOs, and the press flourish in Hong Kong at a time when China is shutting down. Thanks to Hong Kong’s efficiency, and helped by mainland inflation and the appreciation of the Chinese Yuan, Hong Kong is increasingly cost-competitive with Beijing and Shanghai. This is not to say that Beijing will not to seek to punish Hong Kong or that it cannot hurt the city. Beijing almost certainly will take a harder line in Hong Kong. For the city has not behaved as Beijing had predicted. There had long been wishful thinking that Hong Kong people would welcome the end of colonialism and a return to the motherland. This was always unlikely. The city’s elite and Beijing have consistently underestimated popular dissatisfaction. Although polls in the first half of 2014 showed a dangerously high level of unhappiness, authorities pressed forward. The August 31 National People’s Congress decision reflected a belief that a hard line would convince Hong Kong people that the best course was to tremble and obey. The protest torch has passed to a new generation. The defining moment of the older generation was the Tiananmen massacre of 1989—an age whose technology was defined by faxes and pagers. For today’s students, the echoes of Tiananmen are as distant as the Japanese occupation of Hong Kong was to their parents. The protestors have time on their side. That they managed to attract more than one million Hong Kong people into the streets to support them was a stunning rejection of the Beijing consensus—the idea of elite authoritarian rule. That Facebook and Twitter and other forms of social media now make it possible to quickly mobilize tens or hundreds of thousands of people for a protest introduces a new dynamic. That thousands of people are prepared to face arrest and perhaps even jail time makes a hardline strategy toward Hong Kong less tenable. This is unlikely to be the end of Hong Kong’s democracy struggle but rather the end of the beginning.